Your customer’s special day is an awesome opportunity for your Shopify store to send out. How? By sending them a personal birthday greeting paired with a discount! Delight your customers to increase your loyalty and drive more sales to your online business! 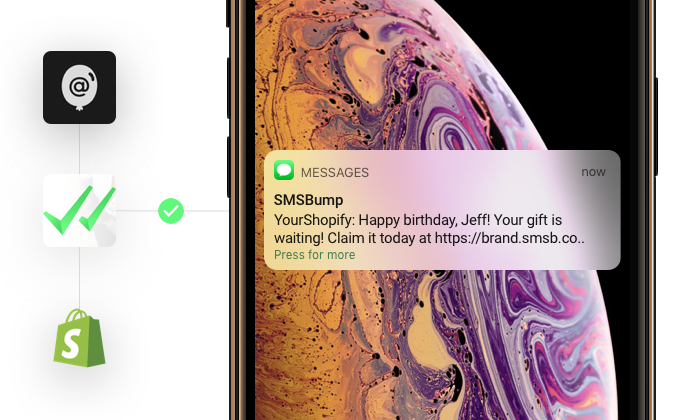 SMSBump and Happy Birthday app by Union Works join forces with an integration that lets you add SMS as a new channel to power up your customer loyalty strategy. Now you can capture customer birthdays and automatically send them birthday wishes using SMS! Before you continue, you can check out this integration setup tutorial so configure the two apps. It's okay, we can wait. Now that you’re ready to start, it’s time to show you a few birthday SMS marketing ideas to get your strategy started. Thank us later. 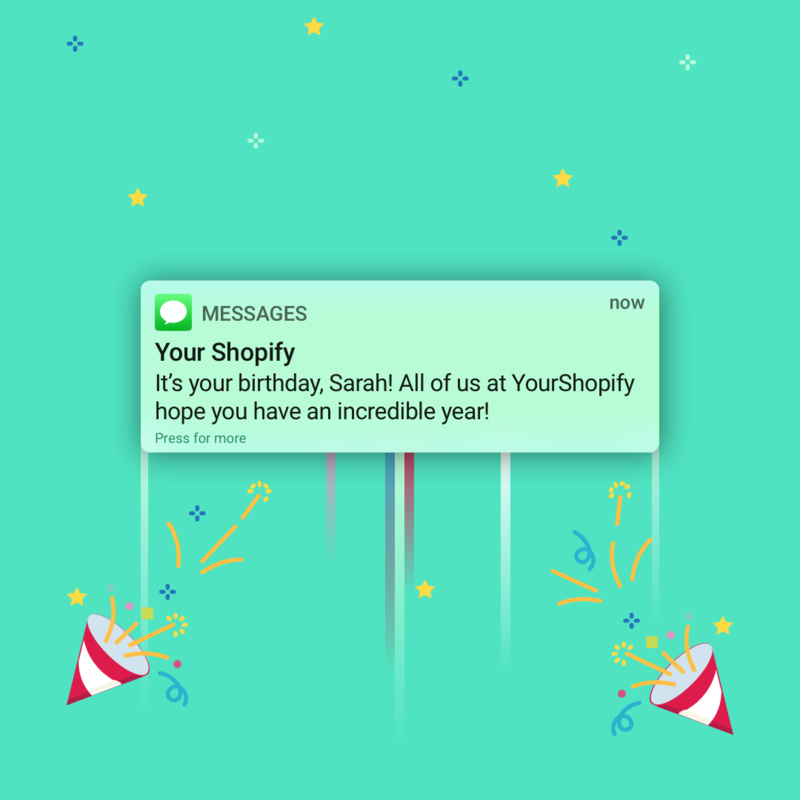 Over half of the Shopify merchants using Happy Birthday Emails send their messages to increase customer loyalty rather than drive sales. Merchants really like the idea of the Happy Birthday app being more of a personal touch rather than a sale driver. Give something without the expectation to get something back. It’s one of the best ways to make a great impression on your customers. Customers value this kind of experience and it always leads to positive results. When you use SMS to send those birthday wishes, the high open rate can almost guarantee that nearly all your customers will see their messages. Personalized discount codes can include the customer’s name to form something like JAKEBD to really nail their attention and make it hard for the customer to ignore. You can send customers an automatic SMS offer with a special discount code they can use on their birthday to shop whatever they want from your Shopify store. Take the personal touch to a new level with a personal text message on their birthday showing not just their special deal, but that you care enough to go that extra mile. Now you can automate this entire process by connecting SMSBump and Happy Birthday Discounts using the setup tutorial here. One of the best ways to use SMS automations for your Shopify store is to send them to your customers for time-sensitive deals and promotions. You can create urgency by sending SMS text messages to your birthday boys and gals letting them know that they have a few hours or days to claim their gift or discount. Most of those promotions usually go into your customer’s inbox or social media feeds. Today, those channels aren’t actionable enough to get those sales going. SMS is one of the best tools for that because customers see it instantly, they view the information in a matter of seconds and can take the action right away. A frictionless experience. Surprise and delight your customers! We’re really excited to announce this integration with Union Works, the team behind Happy Birthday. 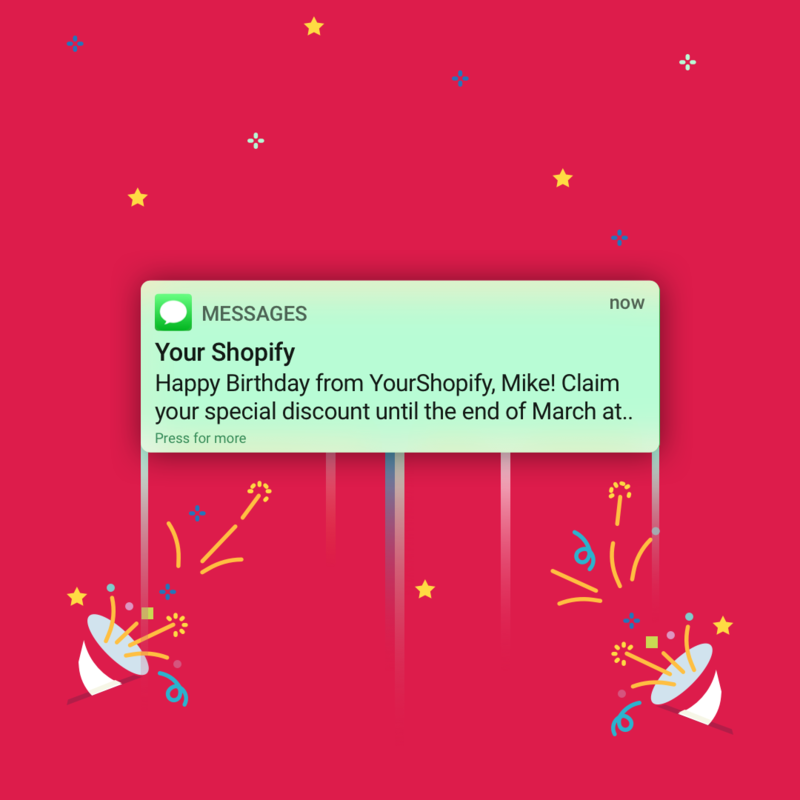 Connect the apps today and start automating SMS birthday wishes to increase sales and offer customers a unique experience with your brand!